Meeting with Ed.D. thesis supervisor: the confusion around ‘digital literacy’. I had another Skype chat with my Ed.D. thesis supervisor, Steve Higgins, last night. I really enjoy our informal video conferences as he’s at the forefront of things at the University of Durham (and further afield! ), as well as being very experienced and intelligent. Hierarchical model of digital literacy? I brought up the possibility of coming up with some kind of ‘hierarchical model’ of concepts in the digital literacy arena. 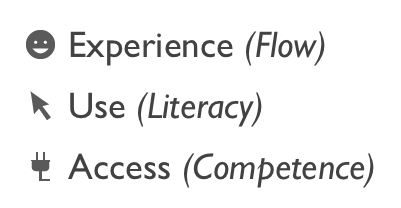 Perhaps ‘digital competency’ would be at the bottom, with ‘digital literacy’ above it and ‘digital fluency’ as being at the top of the conceptual pyramid? Steve agreed that this may be possible as ‘competence’ has a restrictive element to it in that it can be assessed or measured – it is bounded in some way. Literacy implies some kind of transferability which is, presumably, why educators like it as it assumes more than mere ‘competence’. Problems arise, however, when people want to be able to ‘assess’ digital literacy as what would such a test look like? Finally, the idea of ‘digital fluency’, Steve wondered, would surely be an extension of digital literacy rather than something separate? Again, this is something I need to go back to the literature and investigate! Steve mentioned en passant that librarians have really latched on to the term ‘information literacy’ as it describes what they are trying to engender in students and library users. We then discussed the use of ‘umbrella terms’ by those coming at new literacies from a particular angle. I mentioned the fact that not only do people try and use their preferred term as some type of overarching term encompassing other literacies, but that some make up words to try and make a name for themselves when doing so! Regarding 21st century skills, I wondered about the relationship such an idea may have with ‘digital literacy’. Steve said it was worth looking at in terms of the formation of the phrase and where the drive is coming from. Is it coming from politicians worried about global economic competition and effectiveness, or from educators? If the latter, is it coming from those who would be considered ‘digitally literate’ or not? We discussed the EU, and Norway in particular, as being at the forefront of ‘digital literacy’ from a participatory rather than simply an economic perspective. I’m going to compare and contrast this with views from (for example) the USA and Singapore. Whilst I was aware of some of his work, Steve thought that Paolo Freire’s idea of conscientization might be applicable to my thesis. This is something I need to explore more thoroughly, but the concept of an ’emancipatory literacy’ which is in some way opposed to ‘functional literacy’ would set up a good dialectic in my argument, I think! We came back to the previous discussion of whether ideas of ‘literacy’ in the EU, Singapore and USA involved an emancipatory element. I’ve mentioned before on this blog how struck I was with Martin’s idea of ‘liquid modernity’. Steve and I discussed the relationship between knowledge and technology and how, because of the rate of change of technology, ‘literacy’ and ‘knowledge’ are always in a state of flux. I raised my concern with Steve that this would mean not even a working definition of something like ‘digital literacy’ could be achieved. He responded that going to some type of ‘meta-level’ without specific mention of technologies, so long as it was rigorous enough, would work. Steve mentioned the idea of ‘punctuated equilibrium‘ in evolutionary theory and how technological advancements can be seen in a similar way. We moved into discussing cultural practices – for example the difference between being able to quote someone and/or use their ideas in your own words, compared with copying word-for-word what they said. At what stage will we privilege ‘organization’ as a higher-level skill? After Steve raised the above, it got me thinking about Lessig’s book The Future of Ideas, which I’m currently reading (and have blogged about). Lessig talk about ‘remix culture’, something which Steve said he had a slight problem with as it has a negative connotation as being ‘derivative’. Howeer, if there is some type of granularity of reassembling, then such works should be valued as much as the originals. Returning to the idea of a ‘meta-level’ definition for literacies, Steve talked about how they are not susceptible to shorter-term change, but must be applicable retrospectively to, for example, someone in Roman times. Obviously the ‘digital’ element will not apply, but the other elements should have some explanatory power. Just before we finished, Steve drped a bit of a (positive) bombshell. Up until now I’ve been focusing on the ‘literacy’ aspect of ‘digital literacy’. But what about the ‘digital’ part? What makes something digital? How are, for example, a cassette recorder and a digital recorder different? Do they involve different skills? Finally, Steve gave an example from a project he’s working on. He’s part of a group at the University of Durham experimenting with ‘multi-touch tables’. He talked about how some Year 6 pupils had seen him and other supervisors use ‘hidden menus’ within the software. The children only had to see this once to be able to access this themselves. Steve wondered wither this would fit into ideas of ‘digital fluency’. This reminded me of the work of Sugata Mitra, creator of the ‘Hole in the Wall’ computer and ’emergent literacies’. This is, again, something I need to explore in more depth, but Steve said it fits in with the currently-popular Activity Theory (of which he’s not a big fan) and his concerns about the literature on literacy focusing on meaning rather than intention. It turns out that Mitra is now at Newcastle University, which is handy!